and a perfect addition to the school lunch bag. This recipe came from Betty Crocker's cookbook (copyright 1969)...which happens to be one of my old favorites. Stir in milk, oil and grated apple. Mix in remaining ingredients, just until flour is moistened. Batter should be lumpy. Fill greased or paper lined muffin cups 2/3 full. 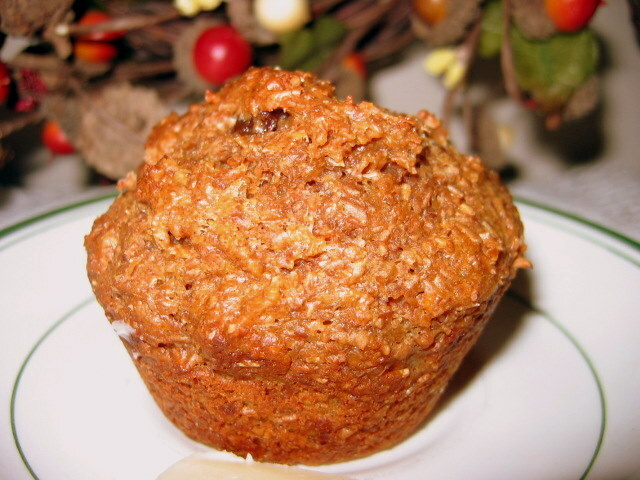 *Optional Crunch Topping: Sprinkle muffins with a mixture of 1/3 cup brown sugar, 1/3 cup chopped nuts and 1/2 teaspoon cinnamon. 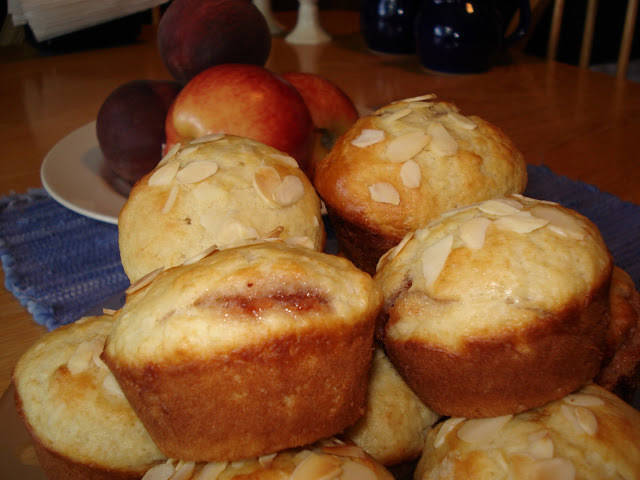 The topping is wonderful on fresh muffins...not quite so good later on. This is going to be a very simple and “maybe everyone knows how to do this”post, but I thought it would be kind of fun to put this annual fall activity to memory. 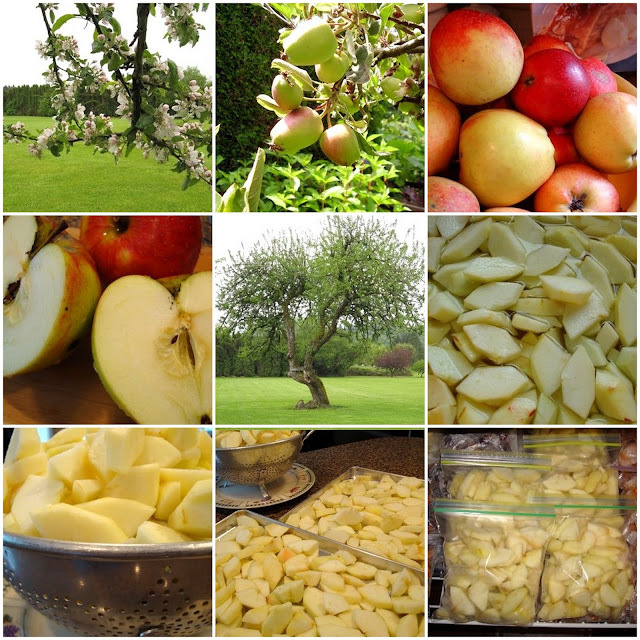 My parents bought some land by a lake 30 years ago and, besides enjoying many family gatherings there, we have enjoyed the apples, pears, plums, walnuts and hazelnuts that come free to the family that’s willing to go and pick or gather them up. put apples in ziplock bags, pushing out the air, and store in your own organic freezer section. I got the following pastry recipe from my friend Joanne, who is also Celiac. It is excellent tasting pastry ( as good as regular pastry) ! I know because I ate it before I knew I was Celiac and I was amazed that I could not tell the difference. The dough is also fairly easy to handle. 3. Beat egg , add vinegar and ice-water. 5. You may knead this a bit since rice flour crust can stand handling. Knead until you have a smooth soft ball. 6. 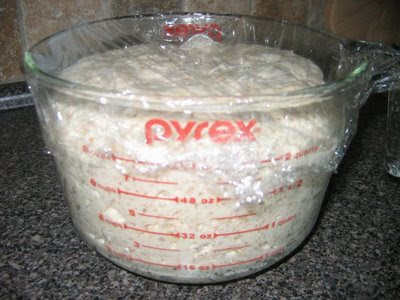 Refrigerate dough for 1 hour or more to chill. 7. Roll out between wax paper dusted with sweet rice flour. I scotch tape the wax paper to the counter to keep from sliding. 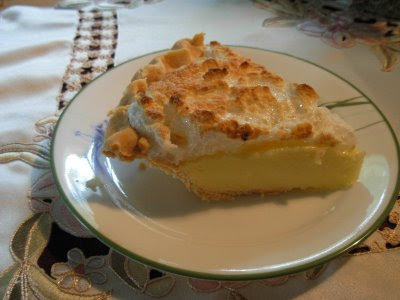 Peel off top layer of wax paper , flip over onto pie plate and then carefully peel off the other layer of wax paper and fit pastry into pie shell fluting edges -- for single crust pie or for double add filling and then top with top crust . 8. Bake at 375' until lightly browned. The ingredient list is very simple but you will need one piece of critical equipment. You must use a heavy enamel cast iron pot, either round or oval doesn't matter but it must have a heavy lid. My pot is oval and measure 4 inches high, 10 long and 8 inches at the widest. Stir the flours and the gluten together in a large glass mixing bowl. Add the yeast and the salt. Cover bowl with plastic wrap and leave at room temperature for 12 - 15 hours. Place a piece of parchment paper in a a heavy enamel cast iron pot with a lid. Shape dough into a ball and place on a piece of parchment paper covered with a large bowl for an hour or until double. Place heavy dutch oven with with lid into the oven and preheat to 450F. Remove pot from oven, place the dough with the parchment paper inside, place on lid and bake for 30 minutes. Remove lid and continue to bake for another 10 - 15 minutes until evenly browned. 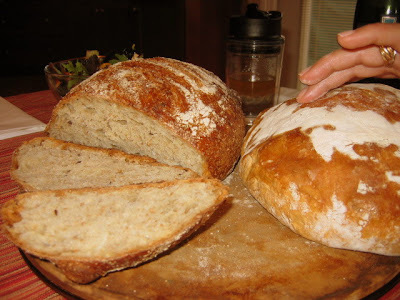 Remove bread with parchment to a wire rack to cool. My friend Dorothy submitted this recipe to our first GWG Greendale Church cookbook. It's been a favourite of ours for years. Definitely one of those comfort food recipes. It's a good dish to feed to those "fussy about veggies" kids and grandkids (and their elders). Cut the end off the squash and peel. (I use a good potato peeler) Peel and core the apples. Cut the squash and apples into 1 inch cubes and place in casserole dish. Combine remaining ingredients except pecans and spread over squash and apples. top with chopped nuts if desired. Cover with lid or foil and bake for 50-60 minutes in a 350 F degree oven. Or you can cook it in the microwave until tender. Either way it makes a wonderful fall side dish. I love the combination of flavors in this cake, but since there are those in my family who don’t care for for cream cheese, I don't make it as often as I'd like. I got the recipe from my friend Karin, when we were young moms, getting together for coffee while our toddlers played. I’ve modified the recipe somewhat. 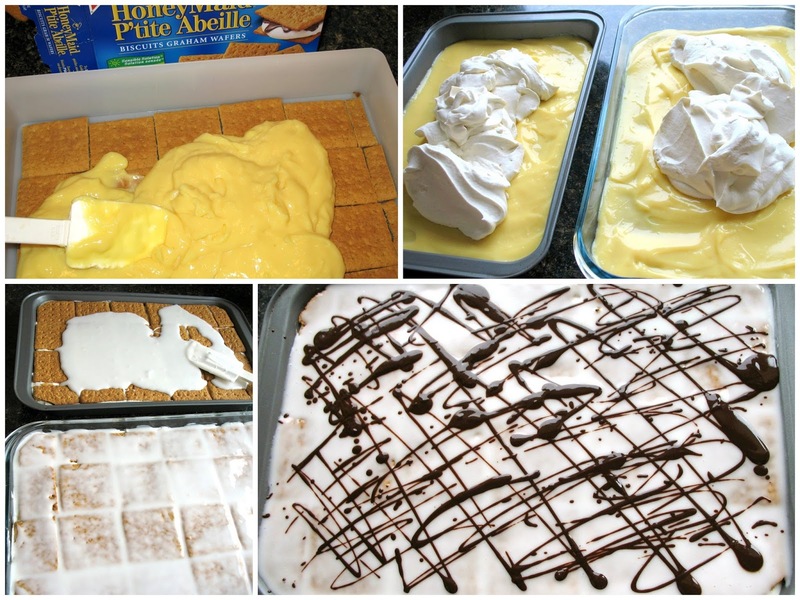 This is one of the recipes I made allot for care group nights. It's not healthy at all but that is why it tastes so good. 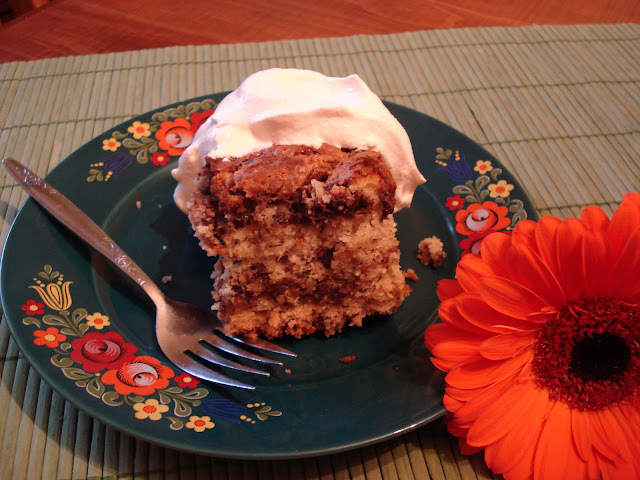 The canned fruit adds moisture to the cake and the topping is just plain fattening and delicious. It is a must to heap copious amounts of whipped cream on top and forget about the calories you are consuming and enjoy your cake! A good rich cup of coffee is a must with this cake. Combine all ingredients accept the flour and beat together well with an electric hand mixer. Add flour and blend until flour is all absorbed. Grease a 9x13 pan or a 10-12 inch round or spring form pan. Bake cake for approx. 45 minutes @ 350. Just before cake is done place the topping ingredients in a microwavable bowl and bring to a full boil. Watch that it does not boil over. You can also do this on the stove top stirring constantly. Remove cake from oven and immediately poke fork holes all over the top. I make them about 2" apart over the whole cake. Pour the hot topping over the cake slowly allowing the topping to soak into the holes. This makes the cake very moist. Allow cake to cool on counter. Serve with whipped cream or ice cream. It is best when served just barely warm, but keeps in the fridge for a day or two. I have never frozen this cake, but I don't think the results would be the best. don't even bother asking about the calorie count in this one. Just eat it! 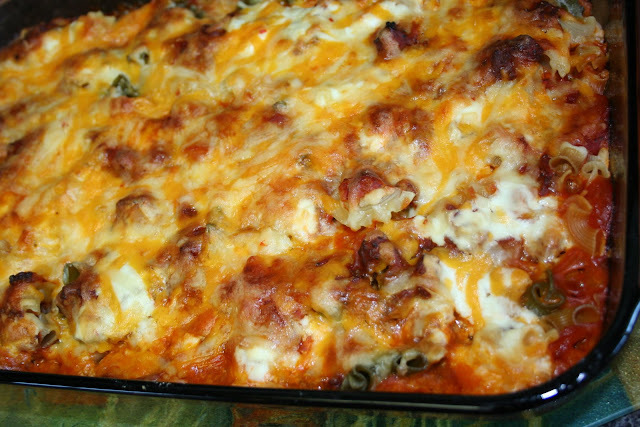 Years ago my Auntie Betty made this casserole for us and we enjoyed it so much that it has been a favorite of mine ever since. Mix first 5 ingredients then add the sour milk. Add mixture to dry ingredients. Place 1/2 the batter in a 9x13 pan and sprinkle with 1/2 of the topping. Repeat the layers and bake at 350 for about 50 minutes. Or until tooth pick comes out clean in center. Serve with a generous dollop of cinnamon whipped cream. In a cold bowl chilled in refridgerator with the beaters, Beat the cream mixed with desired amount of icing sugar and cinnamon until stiff peaks form. This is super simple and has just a hint of banana marbled with chocolate, topped with vanilla ice cream, (try this was butterscotch ripple, Mmm) smothered in a luscious strawberry sauce. I freeze bananas that are too ripe to eat because hey are better to bake with than the fresh ones in my opinion. I got this recipe from a co-worker about 25 years ago. We still enjoy it. Grease a bundt pan. Set aside. In mixing bowl beat butter on medium speed about 30 seconds. Add sugar and vanilla and beat until creamy and fluffy. Add eggs one at a time beating 1 minute after each addition. In a small bowl stir together mashed banana, sour cream and milk. Add dry ingredients and banana mixture alternately to beaten mixture, beating on low speed after each addition until just combined. Into 1 cup of the batter, fold in cocoa mix or syrup, stir gently. Add batter to cake pan and pour chocolate batter over plain batter. Swirl. Bake at 350 degrees F for 60 - 70 minutes, or until cake test is done. Cool 5 minutes in the pan. Gently remove and serve with the following strawberry sauce and ice cream. Thaw berries if frozen and drain, saving liquid. In a saucepan add water to drained liquid to equal one cup liquid. In a saucepan, mix liquid and sugar, stirring until sugar is dissolved. Mix cornstarch with a little water and add, cooking until mixture runs clear and thickened. Add berries and lemon juice. Cool. 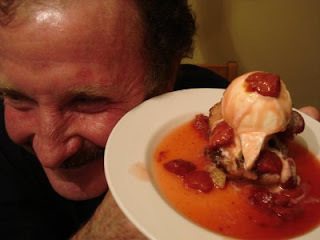 When cake and sauce are cooled, top with ice cream and sauce and voila ... dessert. Serves 12. This creamy dessert has been a family favorite for many years and is my daughter's choice for a birthday cake. She's not big on cakes and since today was her 30th birthday she got to pick and choose! I got this recipe from my friend Wendy about twenty years ago, but have seen versions of it in recipe books. Line 9 x 13 inch un-greased pan with whole graham wafers, trimming to fit. When our family comes for Sunday brunch I often make this batter first thing in the morning or the night before and keep it in the refrigerator or if they are calling when they are on their way, I let it sit on the counter. 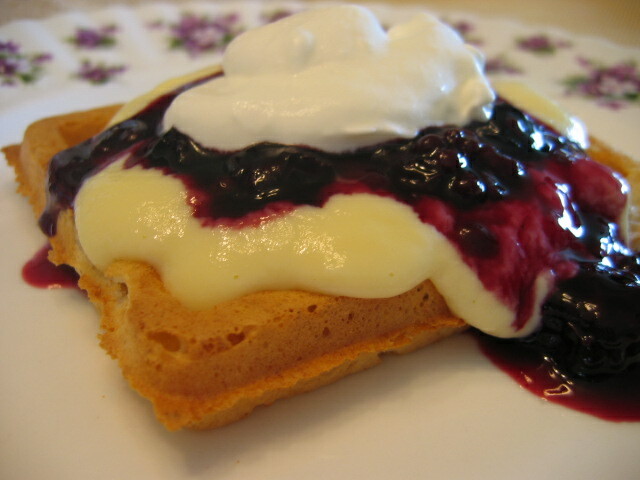 The timing works wonderfully to make the batter and then start the vanilla custard and berry sauce. While you are working on the custard sauce and berry sauce you can easily put a bag of hashbrowns in the oven on a cookie sheet to bake. Stir them once in awhile to crisp them and and have bacon ready to put in the oven in a single layer on parchment paper for 20 or until crisp. 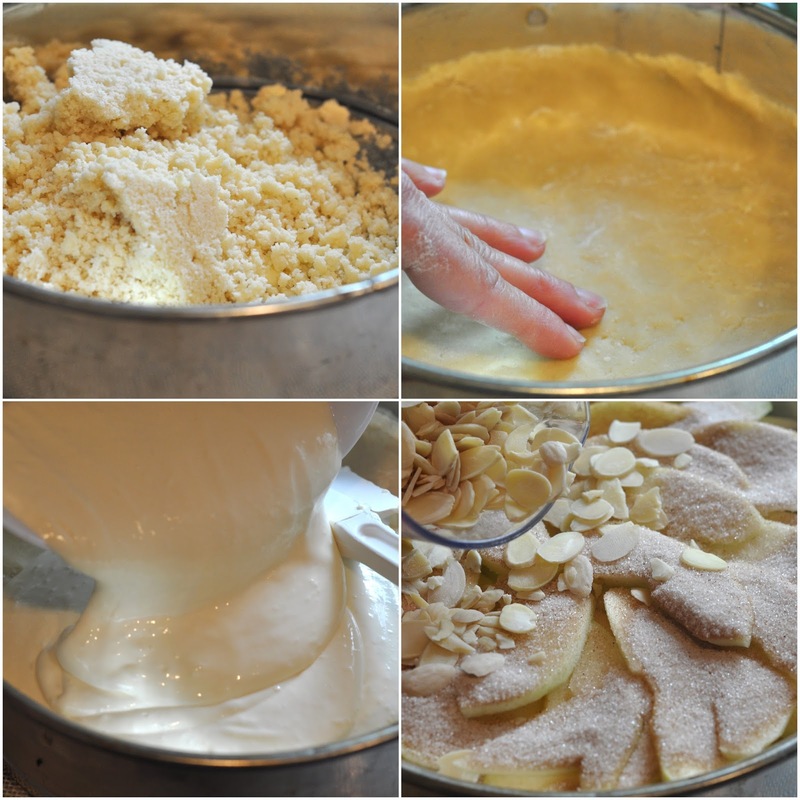 In a large mixing bowl, combine the yeast, warm water, and sugar. Allow to sit for about 10 minutes and until puffed. Add the milk, melted butter that has cooled a wee bit, the eggs and tablespoon sugar and the salt. Using a mixer, combine on medium speed until smooth. Add the flour and mix slowly until combined. Cover and refrigerate overnight, or let stand on the counter several hours. Bake the waffles in a hot waffle iron until the steam stops. In a microwave safe 4 cup measuring cup, combine the sugar and the cornstarch and salt. In a small bowl, beat the eggs, and add the milk. Stir with a whisk the milk and eggs into the sugar mixture. Cook in the microwave at one minute intervals , stirring with a whisk until it is boiling. Add the vanilla, stir well, and cover with plastic wrap and allow to cool until serving time. Mix the sugar and the cornstarch in a small bowl. Heat in the microwave at one minute intervals until the berries thaw. Add the sugar and cornstarch. Continue to cook in the microwave until bubbly and slightly thickened. Allow to cool until serving time. A few weeks ago we planned to have a wiener roast and I got to thinking that I used to make homemade hot dog buns for our wiener roasts and so went on a search for the recipe. I didn't find my original recipe but found one on allrecipes.com that seemed similar. This dough can also be used to make hamburger buns. Heat milk, water and butter until very warm. In a large bowl whisk together 1 3/4 cups flour, yeast, sugar, and salt. Mix milk mixture into flour mix, add egg and mix well. Stir in remaining flour 1/2 cup at a time beating well after each addition. When the dough has pulled together, turn it out into a lightly floured surface and knead until smooth and elastic. I did this all in my Braun machine...that handy little thing! Divide dough into 16 equal pieces, recipe called for 12 but it was stated that they were pretty big and 16 was suggested, which I did and they were the right size. With rolling pin roll and shape each piece into a 6 x 4" rectangle. Starting with the longer side roll up tightly and pinch edges and ends to seal. I didn't pinch the ends and they were okay. As you can see on the pic that mine didn't look perfect..should we say rustic, maybe? Place on greased baking sheet and let rise 20 to 25 minutes. Bake at 400º for 10 to 12 minutes until golden brown. Here the wieners are roasting.. turning black just the way I like them! Oh my they were so good..add a few veggies, chips and rice salad (which I posted some time ago) and dig in! I love wiener roasts and hope to have a few more before the snow flies. Actually it is quite fun to have winter wiener roasts as well, then you just cozy up to the fire! This unusual appetizer is reminiscent of the lettuce wraps served in our local Chinese Restaurant. Iceberg lettuce leaves - either the small ones from the inside of the head or use a pizza cutter and cut round shaped cups from the larger leaves. Heat BBQ grill to medium high. In a small bowl, whisk the Hoisin sauce, rice vinegar and Soy sauce until blended. Divide the Hoisin mixture equally into into 2 bowls. Set one aside - you will use it to moisten the chopped chicken later. Season the chicken with the salt and pepper and brush with the Hoisin mixture from one of the bowls. Grill the chicken thighs, covered, until well browned and beginning to blacken around the edges - about 5 minutes. Turn the chicken over, brush with the sauce and grill for another 5 minutes or so. Continue flipping the chicken and brushing it with the Hoisin mixture until the chicken is thoroughly cooked. This does not take very long. Remove from grill and let it rest for 10 minutes. Chop the chicken into a fine dice. Transfer to a mixing bowl and add the Hoisin mixture, the basil, parsley and chives. You can refrigerate the chicken at this point. Just before spooning onto the lettuce leaves, stir in the peanuts. Place one heaping tablespoon onto each lettuce cup (I use a mini ice cream scoop), arrange on a platter and serve. You may want use the Hoisin sauce as a BBQ sauce. I've often cooked the chicken for supper and saved 4 thighs to make an appetizer for the next day. For years this has been a "for sure" when planning the holiday menus. 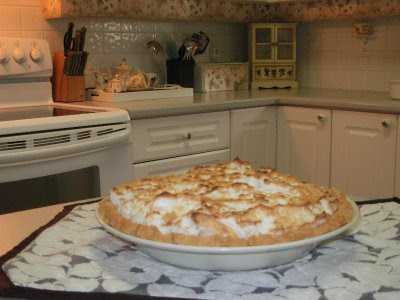 The Puff is light and creamy with a crisp topping and "just" a hint of sweet. Put yams on a baking sheet and wrap them in foil and bake them at 350 F for an hour or until very done. I slide a sharp knife into the largest one to ensure it is soft enough to mash. After the Yam has been measured, mash it really well with a potato masher. Combine the flour, sugar, Baking Powder, salt, pepper. Stir into the mashed yams. Butter a flat casserole dish and spread the yam mixture into the pan. Combine the crumbs and butter and sprinkle over the Yams. Bake at 375 for about 45 minutes or until golden browned and puffed. I bought a number of pumpkins from a farm last week. I baked and pureed them...there is nothing like fresh pureed pumpkin! I baked pumpkin pies for our Thanksgiving dinner and I still had puree left over and decided to make donuts. These donuts taste amazing and I will make them again. In a mixing bowl beat eggs, sugar, and butter. Add pumpkin and lemon juice, mix well. Combine flour, baking powder, baking soda, salt, cinnamon, and nutmeg and add to pumpkin mixture alternately with milk. Cover and refrigerate for 2 hours. Turn onto lightly floured surface and knead 5 or 6 times. I needed extra flour to roll out the dough. Roll to 3/8" thickness and cut with a donut cutter. In deep fryer or skillet ( I used my wok) heat oil to 375º. I test to see if it's hot enough by putting a 'donut hole' in the oil and if that rises to the top immediately you know the oil is hot enough. Fry donuts, a few at a time until golden, about 3 minutes, turn once and remove with slotted spoon and drain on paper towels to soak up excess oil. 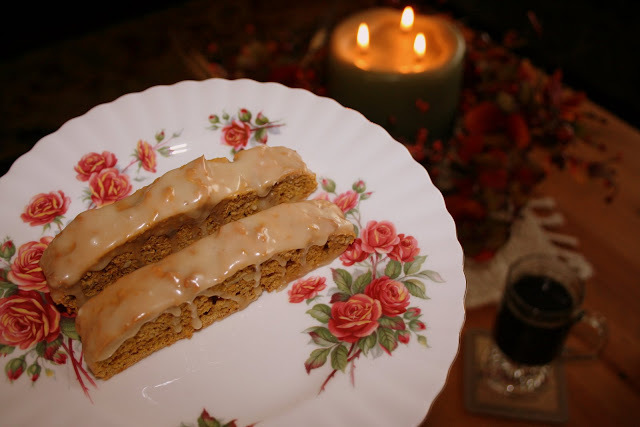 *I looked for a frosting with pumpkin puree and found one at http://www.foodnetwork.com/ I only made half of the recipe as I wasn't planning on frosting all of the donuts. 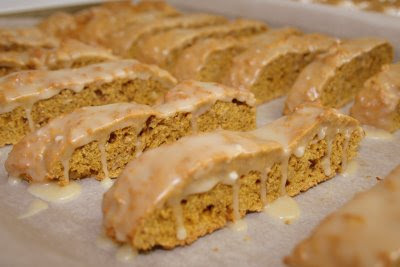 Beat cream cheese, pumpkin, nutmeg, cinnamon, orange zest, and vanilla together with a hand mixer at medium speed. Add icing sugar and beat until frosting is fluffy. Once donuts are cooled spread with frosting. I frosted some with the pumpkin cream cheese frosting and sprinkled with crisp gingersnap cookie crumbs, some I coated with a sugar/cinnamon mixture and some I left plain. Crushed peanuts or toffee bits sprinkled on the frosted donuts would be very good as well. 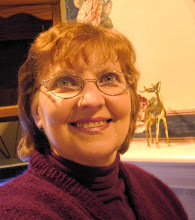 Growing up on a chicken farm my Mom would often make a Roasted Chicken with Bubbat for dinner. Every now and then my nostalgic side takes over my taste buds. . .and the old recipes need to be made once again. 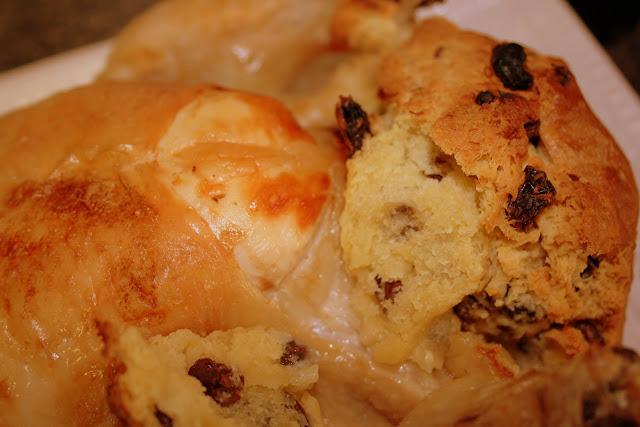 Bubbat is really just a raisin quick bread that is baked inside the chicken while it is being roasted. It also can be baked along side the chicken or even baked in a 8 X 8 square pan and served with the chicken. Baking it inside the chicken gives it the best flavour since it is kept moist by the chicken drippings. Mix the dry ingredients. Add the beaten egg, melted butter and milk. Mix well, and add the raisins. You can either spread it in a greased cake pan. . and bake it. .
or you can spoon it into the cavity of the chicken. I used a ordinary 3 - 3 1/2 pound fryer but would have doubled the recipe for a large roaster. Baste the chicken with melted butter and bake uncovered for about 2 hours at 375. I recently saw an article about the confusion between yams and sweet potatoes. 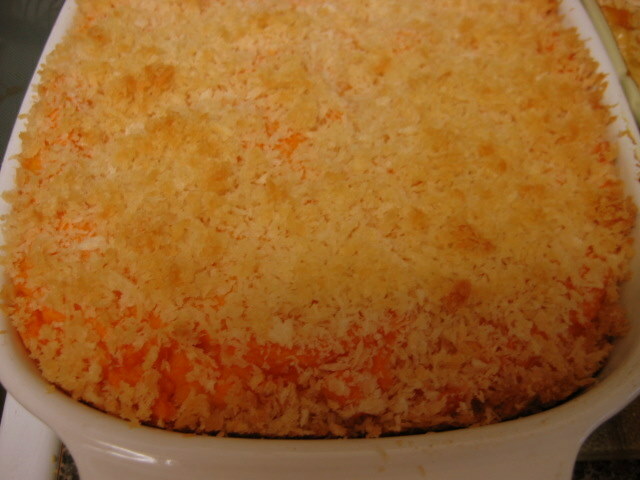 The origianl recipe that inspired this one was called Sweet Potato Casserole, however, the picture showed the orange flesh. In our area the orange fleshed potatoes are yams and the white fleshed are sweet potatoes, but I've come to learn it all depends on where you live. This recipe uses orange yams and lightens up on the sugar and butter. It is still quite sweet, but so delicious with turkey dinner. Peel and cut yam crosswise about 1/2 inch thick. Arrange half the yam slices in a glass baking dish. Mix sugar, salt and pepper, then sprinkle half of it on the yams. Dot with half the butter. Arrange remaining yams and top with the rest of the sugar and butter. Cover with aluminum foil and bake at 400° F for 30 min. Sprinkle with nuts, cover and continue baking another 45 minutes or until yams are soft. The flavours of Pumpkin and Maple Walnut blend together beautifully. You could leave out the walnuts and use vanilla flavouring if you have nut allergies. Before you begin, Preheat your oven to 350 and toast your walnuts for about 10 minutes or until they begin to smell fragrant while the oven is preheating. Let them cool and then chop. In a small bowl, combine the eggs and the can of pumpkin and the flavouring. On a cookie sheet that is lined with parchment paper, form a log and flatten. Use most of the length of the cookie sheet. . and the log will be about 1 inch thick. Bake at 350 about 30 minutes or until firm to the touch. Slice into one-inch pieces and stand up on the cookie sheet as shown below. enough milk .. a few tablespoons to make an icing that can still be used for dipping. 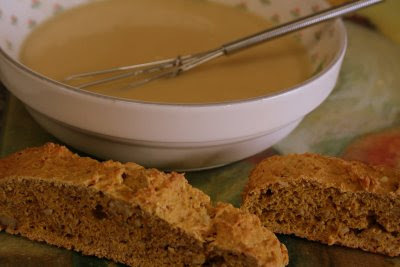 Combine all the icing ingredients and dip each Biscotti and allow to dry on the cookie sheet overnight. These can be frozen or stored in a jar with a loose lid. I first tasted this at Kathy's place and it has become my husband's favourite potato dish since. and is an elegant make ahead dish to serve to company. It has no liquid added but the potatoes bake up moist and tender. size of your pan and how many people you are cooking for. Choose your pan first: I use a glass, straight sided flan dish - either a 9 inch to serve 4-6 people or a 12 inch to serve 6-10 people. You can use a glass pie plate if you don't have a flan dish. Slice 2-4 large onions. I usually cut them in half first and then slice them lengthwise but you can use your preferred method. Just don't chop them. You want nice onion strings. Place onions in fry pan with 1-2 tablespoons butter over medium low heat and saute slowly until onions are a deep caramel colour. This will take about 20 minutes. Peel and slice 2-4 large potatoes. I use a mandoline slicer and slice them right into the flan dish. Cover the bottom of the pan with potato slices - if you want to be fancy you can overlap the slices in a spiral pattern - and sprinkle lightly with salt and pepper. Cover potatoes with 1/2 of the caramelized onions. Repeat with another layer of potatoes, caramelized onions and Gruyre cheese. Bake uncovered in 350 degree oven for about 50 minutes or until potatoes are tender. I copied this recipe years ago from a Taste of Home magazine, I believe. It’s the picture that caught my eye. The recipe called for buttercup squash, which I think I used the first time, but decided to try it with pumpkin the next time. It is very good both ways and a great addition to the Thanksgiving desserts. Prepare 10 inch spring form pan or a tube pan with straight sides, by greasing well and dusting with flour. Sprinkle all over with half of the streusel. Spoon remaining batter evenly over streusel and then spread carefully and finish top with remaining streusel. Bake at 350° F for 55 - 60 min. or until cake tests done. Cool 10 min: remove outside ring. If using tube pan, allow to cool completely then slide a knife around under cake. Holding one hand on top of cake, gently turn upside down and then flip onto cake plate. Yesterday we welcomed Maelyn, my newborn granddaughter, with a baby shower. 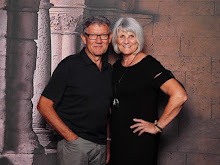 Bronwen (my DIL) hosted the shower and did all the work. I just showed up and brought the cake. A few months back, I pulled a cake recipe out of a magazine, thinking it may just come in handy one day. That day arrived this weekend...and I tried my hand at the Baby Carriage Cake featured in the May 2008 issue of Canadian Living magazine. For someone who likes to play, but has no idea how to do professional cake decorating, this is the perfect cake. 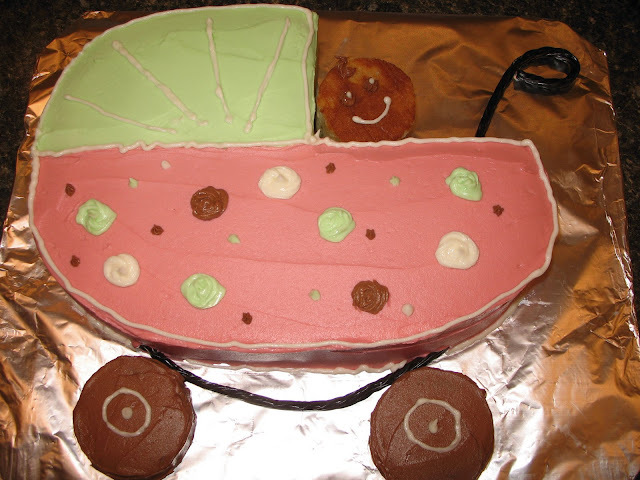 I have done cut-up cakes for the kids and grandkids for years...fun and not too complicated! I'm sure you could use any favorite cake recipe for the base. I decided to do the entire cake as posted in the magazine. I baked the cake the previous day, then popped it in the freezer to make the cutting process easier. I spent Saturday night putting the whole thing together, while I watched listened to Last King of Scotland which was playing on the screen nearby (an excellent movie, by the way). Cut carriage from 9 x 13 inch cake...cut out 4x6 inch rectangle from one top corner and round remaining corners. Cut 2 1/2 inch circle for babies head from the 4x6 inch piece. Assemble on a base measuring about 14 x 17 inches. Reserve 1-1/2 cups (375 mL) white frosting. Divide remaining frosting among 3 bowls. With paste food colouring, tint 1 bowl green and 1 bowl pink. Stir melted chocolate into remaining bowl. Spread 1 cup (250 mL) of the white frosting over top and sides of cake to mask and seal in crumbs. Chill until firm, about 30 minutes. I've never done this step before...but it works great to keep crumbs out of the 'top-coat'. Spread green frosting over top and sides of carriage hood, reserving some for decorating. Spread pink frosting over top and sides of carriage bottom. 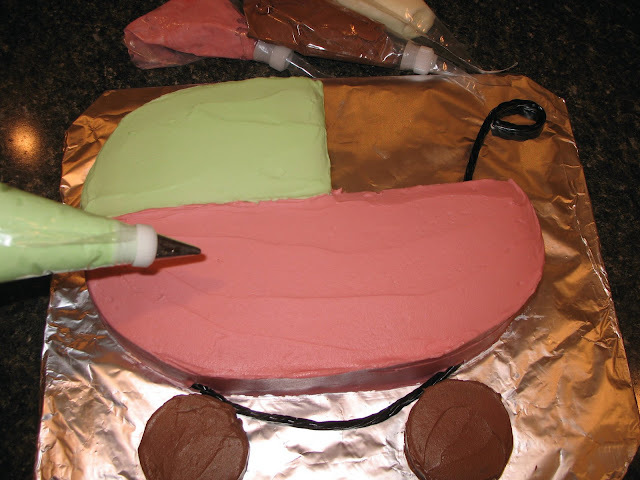 Using small amount of chocolate frosting, attach snack cakes at base of carriage for wheels. Spread wheels with chocolate frosting, reserving some for decorating. Use reserved frostings to decorate carriage, wheels and baby. Twist licorice to create carriage handle and undercarriage; attach to cake. I found the carriage handle would not stay in place without a little glue...so it was firmly attached and not to be eaten! This is a rich moist cake that easily serves 24. Enjoy! Grease sides of 13- x 9-inch (3.5 L) metal cake pan; line bottom with parchment paper. Set aside. In large bowl, beat butter with 2 cups (500 mL) of the sugar until light. Beat in egg yolks, 1 at a time; beat in vanilla. In separate bowl, whisk together flour, baking powder, baking soda and salt... stir into butter mixture alternately with buttermilk. In another bowl, beat egg whites until soft peaks form; gradually beat in remaining sugar until stiff peaks form. Fold one-quarter into batter; fold in remaining egg whites. Scrape into prepared pan, smoothing top. Bake in centre of 350°F (180°C) oven for about 50 minutes or until cake tester inserted in centre comes out clean. Turn out onto rack; peel off paper. Let cool. This frosting spreads and pipes smoothly. Make sure the butter is really soft so the frosting won't split when tinted. In large bowl, beat butter until fluffy. Alternately beat in sugar and cream, making 3 additions of sugar and 2 of cream. Every Thursday afternoon for almost 10 years, I had the privilege of being invited to the home of two friends, and I am always treated to a bowl of soup and freshly baked muffins! I think that she was so tired of me asking for the recipes that for my birthday they gave me the book called "The 250 Best Muffin Recipes" by Esther Brody. So here is one of the many recipes enjoyed by our family. In a bowl combine flour, sugar, zest, baking powder, baking soda, salt. Make a well in center. In another bowl whisk together egg, butter, buttermilk and lemon juice. Add to dry ingredients stir until moistened. Spoon batter into prepared muffin tins, filling half full. Drop a bit of apricot jam into each tin. Top with remaining batter; sprinkle with almonds. Bake in a 375 degree oven for 20 minutes until golden brown. Put up your hand if you have never made these. The new cooks on the block may very well have their hands up now, but if you were baking in the early 80's you most likely have had a well-worn recipe card with a similar recipe to this one. I've made a few changes to the muffin recipe. I thought it was very healthy back then but my sense of healthy food has changed a bit. 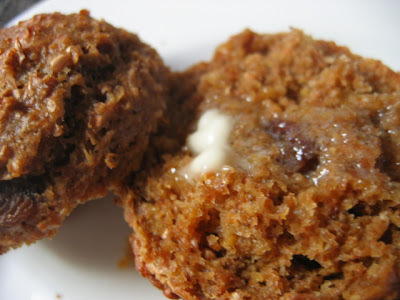 These muffins are perfect for school lunches. My boys took many of these to school. 2 cups boiling water mixed with. . . In a medium sized bowl, pour your boiling water over the All Bran and let cool. .. for a bit. Cream together the oil, sugar, molasses and the eggs in a very large bowl. In a blender put your chopped orange, and half of the buttermilk, and puree well. Add the rest of the buttermilk and the orange mixture into the All Bran mixture. Mix together all the dry ingredients in another large bowl. Now, you can put it into a more appropriate size or two smaller sized containers, cover and keep refrigerated. This muffin mix keeps for 6 weeks. You only need to make what you can eat in a day. In a large pot, on medium heat, bring corn syrup and sugar to boil. Stir in peanut butter and butter. Remove from heat; mix in Rice Crispies. Line a 14x18 inch cookie sheet with wax paper. Press rice crispy mixture into cookie sheet, with buttered hands. In a small pot, melt 1/2 cup butter (remove from heat), add milk, icing sugar, cocoa and vanilla, stirring until smooth. 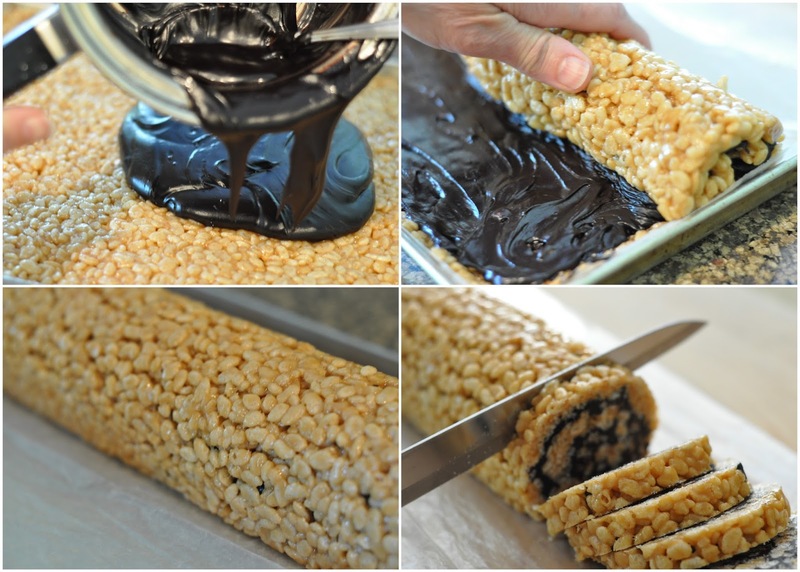 Spread over flattened rice crispy mixture.